A quick word with Kevin Bonnie at International Yacht Collection confirms that he's sold the 49m superyacht Maidelle, listed by Merle Wood & Associates. Built by Trinity Yachts in 2007 to ABS class and MCA compliant, Maidelle offers accommodation for 10 guests in five staterooms, and twin 3,384hp Caterpillar engines power her to a top speed of 22 knots. The yacht has been renamed La Dea II and is available for charter in the Mediterranean immediately with Captain Mark Hoskin and his crew. La Dea II will undergo a refit this winter and will then be available for charter in the Mediterranean throughout summer 2014. In 2015, her programme will take her to exotic global destinations such as Thailand, Barbados and Alaska. 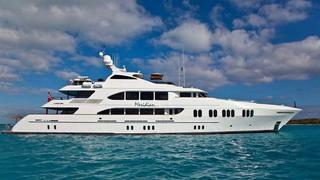 Maidelle was asking $19.95 million.